The United States of America Embassy in Nigeria has clarified that dress code is not a requirement for obtaining the country’s visa. Speaking during a Facebook live session on Wednesday, the consular officers said that the applicants could come with their traditional wears as it makes look unique. The officials addressed the common mistakes seen on DS 160 application form, stating that no one needs to have someone residing in the US and also no prior travelling experience is needed before one can be granted visa. When asked if dress code is being considered during interviews, an official said: “No. It’s not a consideration when doing your interview. “Be comfortable. Don’t feel like you need to put on a suit if you don’t usually wear a suit. Don’t wear a suit. Wear what you would wear if you are going to any normal appointment. Russian University, Michurinsk State Agrarian University celebrates a Nigerian Student, Asomba Nkiru Sandra for her honestly after she found small amount of money left in an ATM. A first-year student of Michurinsk State Agrarian University found a small amount of money left in an ATM and, showing civic consciousness, reported this to the bank. Asomba Nkiru Sandra, being in a big shopping center of Moscow, found a cash in ATM. The girl has not become puzzled, called the support of the Bank and reported his find to the owners. The administration of Michurinsk State Agrarian University thanks the student Asomba Nkiru Sandra for her unselfishness, courage and perseverance in a difficult situation. This is a real example of civic consciousness, generosity and dedication! The United States Embassy in Nigeria says contrary to popular beliefs, its visa officers are not always happy denying the visa applications of Nigerians. The embassy subsequently asked Nigerians to tune into a live Facebook talk at 2 pm on Wednesday. A Facebook post read in part, “Contrary to popular opinion, visa officers do not enjoy handing anyone the 214b refusal letter. However, over 200 Nigerians disagreed in the comment section of the embassy’s Facebook page. Adaobi Emmanuella Njoku wrote, “Contrary to what you just posted, I think and believe they actually do enjoy it because they act like they know it all and still end up giving visas to people without genuine intentions. Another Facebook user, Akufai Valentine Jonah, recalled how he was denied a visa despite obtaining a scholarship in 2013. He also expressed disapproval with the way the consular officer spoke to him. Jonah wrote, “I had a terrible experience in 2013. I got a scholarship to attend a conference in Denver but was denied a visa. I was not angry because I was denied a visa. I was angry with the manner of the disrespect from the consular officer. “Imagine giving one that refusal letter and you are told ‘off you go’ without any tangible explanation, after reading the letter, it states that I don’t have strong ties to my country either through being married, neither do I have a job and back then I used to work with an NGO and it was clearly stated in my application. I have forgotten the third excuse. On Monday evening, fire destroyed part of Notre Dame Cathedral in Paris, the capital of France leaving many in shock. But now, a French billionaire has pledged 100 million euros to help rebuild Notre Dame Cathedral as a defiant President Macron launches a national fundraising campaign to restore the building to its former glory. Francois-Henri Pinault, married to Hollywood actress Salma Hayek, has pledged 100 million euros towards the rebuilding of the cathedral. The blaze destroyed the roof of the 850-year-old UNESCO world heritage landmark on Monday evening, leaving many in tears and prayer. A visibly emotional president Macron, spoke outside the gothic cathedral and said a national fundraising campaign to restore Notre Dame would be launched Tuesday, as he called on the world’s ‘greatest talents’ to help. The UK government is backing an advertising campaign urging Nigerian women and girls to find jobs at home instead of “risking a life of modern slavery” in Britain. Posters are to be placed in schools, churches and marketplaces in an attempt to reduce human trafficking, sexual exploitation and forced labour. They focus on “aspirational stories of women who have established successful careers in Nigeria”, according to the Department for International Development. The Not for Sale campaign is supported by UK aid and involves the National Crime Agency and the UK’s Joint Border Task Force as well as Nigerian law enforcement. One of the stories featured in the posters, TV and radio adverts relates to Gift Jonathan, a single mother who was raped and tortured while attempting to get to Europe but has since returned to Nigeria and found work as a pastry chef. “Three years ago, I was a single mother with two children living with my widowed mother,” she said. “Things were so hard that when my friend told me about travelling to Germany, guy I moved! We only made it to Libya. I was sold, raped and tortured. I saw many Nigerians die including my friend Iniobong. “When I made it to Nigeria, I met with people who registered me in a vocational centre and encouraged me. Nigeria has one of the highest figures for modern slavery in Africa and is one of the top five countries of origin for modern slavery victims reaching Europe and the UK. In 2018 alone, 208 Nigerian nationals were identified as potential victims of trafficking in the UK. International development secretary Penny Mordaunt said: “Modern slavery is one of the greatest human rights abuses of our time. “UK aid is working in partnership with the National Crime Agency and Nigerian law enforcement to stop it at its source. “Together we are tackling the root causes of dangerous migration to prevent vulnerable women and girls from becoming targeted by traffickers. According to Bloomberg, Police have unveiled a new device which can detect when motorists are using their mobile phones while driving. Hampshire and Thames Valley police forces are the first to use the new technology which can determine how many cars on a stretch of road have phones being used without hands-free kits. When the device, created by technology firm Westcotec, spots a phone being used, it will flash a mobile phone symbol at the vehicle to advise the driver to stop using their mobile phone. It can also enable police to identify hotspots where mobile phones are frequently used by motorists. The only disadvantage of this device is that It’s a Bluetooth detector… and all it detects is if the Bluetooth is activated. Israelis head to the polls today for a general election in which electorate will vote a new prime minister. Prime Minister Benjamin Netanyahu is fighting for his political survival. As expected, analysts are speaking on the chances of the front runners. Benjamin Netanyahu is running for his fifth term in office. If re-elected, he will overtake Israel’s founding father David Ben-Gurion in July as the country’s longest-serving prime minister. However, Mr Netanyahu is facing both serious corruption charges, pending a final hearing with the attorney general, and his toughest competitor in years – Benny Gantz. Mr Gantz, a former chief of staff for the Israeli military who is a newcomer to politics, can rival Mr Netanyahu on security – one of the election’s key issues – and promises cleaner politics. His centrist Blue and White alliance – formed with two other former military chiefs and the former TV anchor-turned-politician Yair Lapid – was initially doing slightly better than Mr Netanyahu’s Likud party in opinion polls, although the situation has since reversed. The close race is leading to an aggressive and often dirty election campaign with lots of smear attempts. Israeli voters tend to decide who to support on the basis of the candidates’ personalities, rather than their policies, and whether they consider them strong leaders. No single party in Israel has ever won a majority of seats in parliament; the country has always had coalition governments. That means the prime minister is not always the person whose party wins the most votes, but the person who manages to bring together enough parties to control at least 61 of the 120 seats in the Knesset. Some polls suggest that Mr Netanyahu is more likely to be able to form a coalition than Mr Gantz because of the prime minister’s close relationship with other right-wing parties and religious parties. In a widely criticised move to lock down extra right-wing seats, Mr Netanyahu brokered a deal making it easier for candidates from an extreme-right wing party that many view as racist to enter parliament. Recent weeks have seen tensions flare between Israel and Palestinian militants in Gaza, and US President Donald Trump is expected to publish his plan to solve Israel’s long-standing conflict with the Palestinians soon after the election. However, ways to revive the moribund peace process have not been a main subject of electoral debate. The Israeli public sees little hope in the long-standing international formula for peace – the “two-state solution”. Prominent members of Mr Netanyahu’s current right-wing governing coalition openly oppose the creation of a Palestinian state and want to annex much of the occupied West Bank. Blue and White’s campaign platform refers to “separation” from the Palestinians but does not specifically mention them having a state. It also supports a “united” Jerusalem as Israel’s capital, although Palestinians claim the east of the city as their future capital. Benny Gantz’s alliance also calls for continued control over the Jordan Valley and retaining West Bank Jewish settlement blocs. Settlements are seen as illegal under international law, although Israel disagrees. Israel’s Labour Party, which sealed a breakthrough peace deal with the Palestinians in the 1990s, has lost favour with voters. There are 6.3 million Israeli voters, and the social, ethnic and religious groups to which they belong can be a key factor in deciding what they do on election day. Israel’s religious Haredi population is over a million-strong. Traditionally, ultra-Orthodox Jews of European descent and those of Eastern descent have taken advice from their rabbis and voted for dedicated parties. However, more are now voting for mainstream parties, mostly those on the right. Among the key issues for them is ultra-Orthodox conscription in the military, which is due to come up again in the next parliament. Israeli Arabs make up almost a fifth of the population, but surveys suggest that fewer than half of those eligible to vote plan to do so. Turnout among Arabs was boosted in 2015, when four parties ran together under the Joint Arab List, to take 13 seats. But the list has broken up for this election. The leader of the ultra-nationalist, libertarian Zehut party, Moshe Feiglin, could emerge as a kingmaker in future coalition talks, with polls suggesting it could take at least four seats. Mr Feiglin says he has no preference between Benjamin Netanyahu and Benny Gantz as prime minister. Mr Feiglin is well known for his calls to legalise cannabis but his party has an eclectic platform. He has a hard-line position on the Palestinians and wants to encourage them to emigrate from the occupied West Bank and Gaza. He also calls for a third Jewish temple to be built on the contested holy site in Jerusalem known to Jews as Temple Mount and to Muslims as Haram al-Sharif, which is the location of the al-Aqsa mosque. On Saturday, Nigerians living in the UK gathered at Nigeria’s High Commission in London to protest killings in Zamfara. They urge President Buhari to call a state of Emergency In Zamfara State. The action is the latest by the United States as it tries to squeeze revenue from the cash-strapped leftist government, which has nonetheless held onto power and enjoys backing from China and Russia. The Treasury Department said it was designating 34 vessels of state oil company PDVSA as blocked property, meaning that the United States will block all transactions with them. It also targeted a tanker that ships crude oil from Venezuela to its key ally Cuba, the Despina Andrianna, as well as two shipping companies linked to the vessel — one based in Greece and the other in Liberia. Treasury Secretary Steven Mnuchin in a statement accused Cuba — a bugbear of the United States for decades — of propping up Maduro. “The United States remains committed to a transition to democracy in Venezuela and to holding the Cuban regime accountable for its direct involvement in Venezuela’s demise,” Mnuchin said in a statement. The United States itself was a key market for Venezuelan oil through Citgo, a subsidiary of PDVSA, but Washington has forced the operator to place earnings in a blocked account. 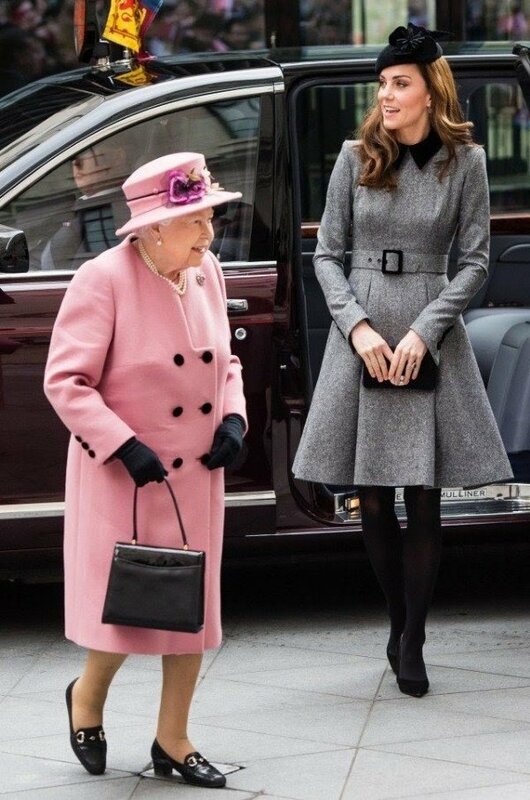 Kate Middleton and the Queen Elizabeth II pulled up at King’s College London on Tuesday to officially open the new Bush House. The new facility will help continue the college’s major role in scientific research and development. Her Majesty, who is Patron of King’s College London ,was chauffeured to the event ( and to most public engagements and ceremonies) in her armoured Bentley State Limousines , which was built to unique and exclusive specifications. 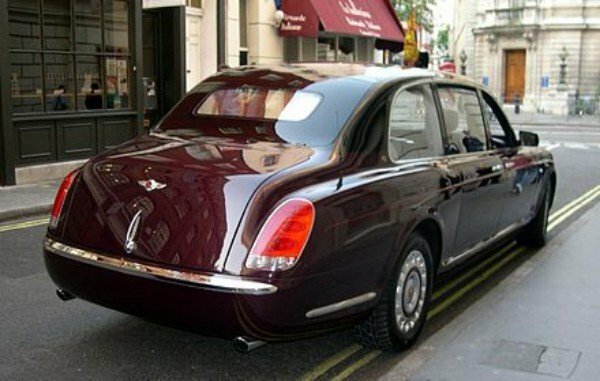 The Bentley was created by Bentley Mulliner on the occasion of Her Majesty’s Golden Jubilee in 2002. The 6.22 metres long limo has rear doors hinged at the back to allow the Queen to stand up straight before stepping out. The 4.4 ton limo is fitted with a unique removable roof covering, which exposes a clear inner lining so onlookers can have an all-around view of the monarch. The rear seats are made with lambswool sateen cloth, while the rest of the interior is made of a light grey leather hide. Power comes from a modified Bentley Arnage’s twin-turbocharged, 6.75-litre V8 engine to produce 400 horsepower . Its maximum speed is 130 mph (209 km/h). 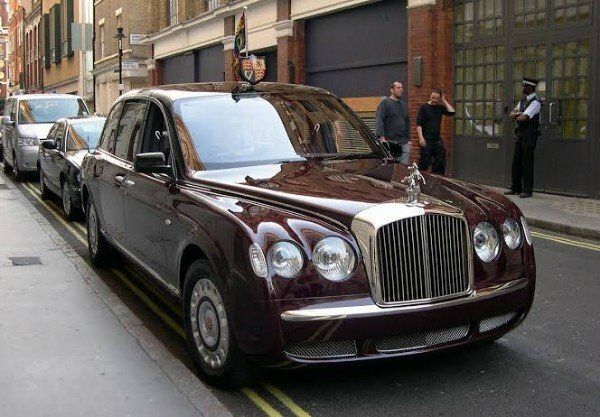 The Queen has two Bentley State limousines in her fleets that are valued at ₦4.7b (10 million GBP) each.